A 2012 article in The Evangelist spurred Mary Laden of St. Mary's parish in Oneonta to contact "Holy Sews." The nationwide organization makes burial layettes for infants who have died in miscarriage or stillbirth. Most often, the "micro-preemies" have passed away during gestational weeks 16-25, so they're far too small and fragile for store-bought baby clothing. When she read about Holy Sews, Ms. Laden wanted to help. She called founder Regina Binz of Our Lady of Holy Souls parish in Little Rock, Ark., and Ms. Binz sent her three layettes as examples of what Holy Sews volunteers create. At first, Ms. Laden was too busy to start working on the project. She set the layettes aside. Two years later, she reached onto a shelf in her office and felt them. Inspired once more, Ms Laden spoke with Rev. David Mickiewicz, pastor of St. Mary's, about starting a branch of the Holy Sews group there. A signup sheet drew parishioners' attention. "It was something I always wanted to do," explained volunteer Sallyann Lamanna. Expecting a small handful of volunteers, Ms. Laden was thrilled when 27 women signed up. In March 2014, St. Mary's Holy Sews was formed. The group's goal is to bring comfort to grieving parents and retain the dignity of the infants who have passed away. So far, St. Mary's chapter has provided more than 450 layettes to different hospitals, funeral homes and families. The layettes are comprised of a tunic that opens down the back and sides to ease around an infant's frail body, a wrap which resembles a hooded blanket, a 12-inch receiving blanket and a small bonnet or knit cap. It takes a few hours to complete each layette. At St. Mary's, Holy Sews members buy soft prints and color-coordinated fabrics, cut them out using patterns and send them home for seamstresses to complete. Knitters make blankets, caps and bonnets. The completed kits are brought back to each monthly meeting, where volunteers attach ribbons and bows and assemble packages to ship to more than 30 different hospitals and funeral homes in the area. Each package also includes a three-inch teddy bear and a memorial prayer card with the child's date of birth, name and footprints. Holy Sews meetings begin with a prayer, with special intentions for guidance from the Holy Family and for the families who will receive the layettes. The "volunteers are incredible," Ms. Laden said, noting that some Holy Sews members have experienced the loss of a child themselves. Though there's no direct contact between the group and grieving families, Holy Sews often receives thank-you notes from nurses who see how much having an appropriate-sized layette for a premature infant who has been lost helps the parents. Often, parents are given their pick of the available layettes -- which may be the only time they get to choose an outfit for their child. "When the baby is presented to the parents," Ms. Laden said, seeing their child dressed beautifully "helps take the sting out of the tragedy" to a small extent. St. Mary's Holy Sews recently held its first fundraiser. The parish's Knights of Columbus sponsored a roast pork dinner, donating all the proceeds to the group. "It went really well! We were very blessed," Ms. Laden told The Evangelist. At the dinner, paintings by the late Alice C. Muller of Chenango County and designer purses were donated for a silent auction that raised more than $730. It may become an annual event. 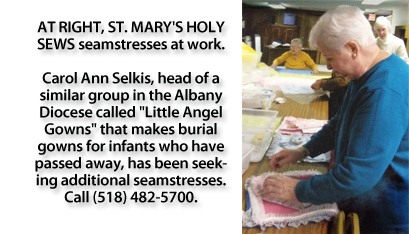 St. Mary's Holy Sews members hope more branches of the organization form in New York State. Since the group gives out the layettes for free, fundraising and donations are necessary. New volunteers are always welcome, too. "I feel it's a calling," Ms. Laden said. "Now, I can reach out and help those less fortunate." Sallyann Lamanna said she can't imagine what the parents are going through. St. Mary's Holy Sews is a cause that's "near and dear to my heart," she said.